This 28th of December, 2011, Seventh HIGH is holding a charity drive for the victims of typhoon Sendong in participation with DSWD. Seventh HIGH, a year old boutique nightclub in Manila, has been known to throw special charity events for different causes, including Breast Cancer Awareness, Pediatric Cancer Wards, and even HIV efforts. In light of the recent tragedy in Mindanao, Seventh HIGH seals 2011 with what the hope would be their biggest call to compassion. 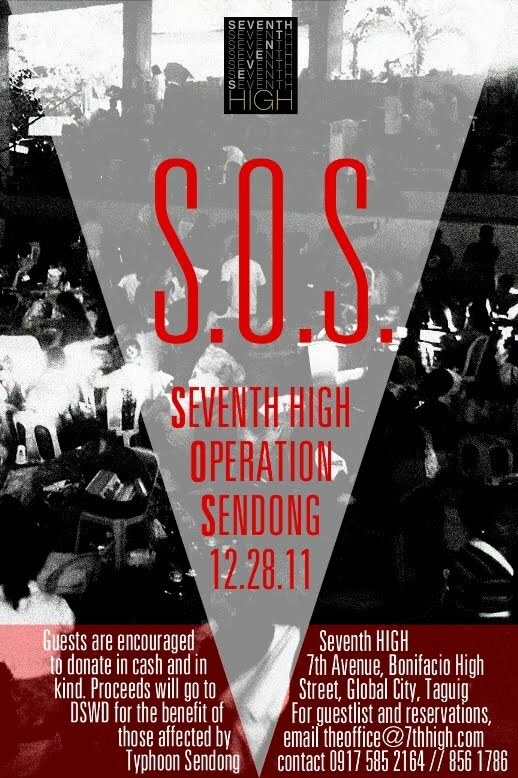 The event is entitled SOS: SeventhHIGH Operation Sendong. Raising awareness among the urbanites of Manila, it encourages its attendees to help by bringing donations or pay door charge in order to be part of the party. Donations and door proceeds will be given to DSWD in their relief efforts for the victims of typhoon Sendong. Supported by a large roster of celebrity and model dj’s, bartenders, and guests, the young club hopes to give its attendees an inspirational celebration of humanity that brings together music, fashion, and arts in a unified effort to revive Mindanao. SOS is expected to be a big effort that calls to action different sectors and age groups in cosmopolitan Manila. This event is open to public. Seventh HIGH is located at 7th Avenue, Bonifacio High Street, Taguig City. For inquiries and reservations, interested groups and individuals may call 09063786916. I took part within several charities for the Sendong victims in December last year. I feel like I have worked with this group.